Agricultural biotechnology was again at the center of discussion during the biggest agricultural expo in Uganda, which ran from July 17-23, 2017. 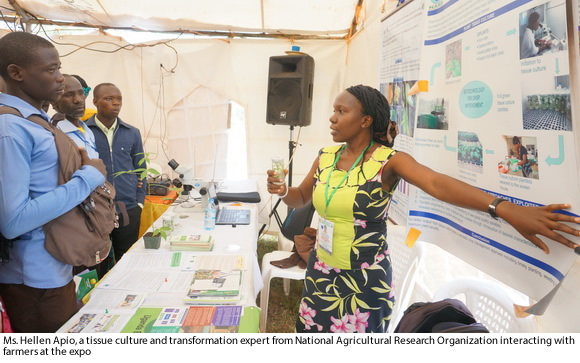 Dubbed the 25th Annual Source of the Nile Agricultural Show, this year’s theme was Managing the Challenges of Climate Change for Sustainable Agriculture. While officially opening the show on July 18, 2017, the President of Uganda Yoweri Kaguta Museveni reiterated his continued support for biotechnology, and noted how it could address some of the challenges facing the agricultural sector. The President also used this as an opportunity to educate the public on biotechnology. “I have been doing biotechnology all the time. Therefore, this breeding is traditional actually,” President Museveni noted. He went on to explain how farmers in rural areas had been traditionally selecting crops and animals for various purposes, which essentially is what scientists do while doing biotech research. The President used an example of his cows to further elaborate on what biotechnology is. “I have been doing this with my cows, where if I want those with longhorns and not short ones, I cross-breed to get the desired ones.” He noted that biotechnology is only more precise at doing what traditional breeding does. The president likened those who don’t understand biotechnology to ‘flat earthers’, who think the earth is flat, and not round. The president further expressed his frustration on the delayed passing of the biotechnology and biosafety law, which would allow farmers to have access to biotech crops. He noted that this was a huge mistake on the side of the legislators. The Biotechnology and Biosafety Bill, which is currently before parliament, has been on the shelves for more than four years. However, there is renewed optimism that it will pass into law, given high level political support it has received in recent times. Uganda Biosciences Information Center (UBIC), in concert with other biotech players exhibited information materials on current biotech research in Uganda, frequently asked questions on GMOs, and biotech applications in other fields such as medicine. For more information, contact the UBIC Coordinator at ubic.nacrri@gmail.com.